I knew this was an important topic, one that people were afraid to talk openly about because they were embarrassed or unsure. It’s not easy to admit when your marriage is struggling, especially with something like (what some people called) a harmless flirtation. The dialog that started because of my early assignments continued, and I kept hearing from people who were struggling with emotional affairs. They wanted help and advice, and the more I researched, the more I shared about the things I found out. Several months ago I had an article published in Christianity Today about inappropriate friendships, and one of the comments there was what do you do if your spouse is having an emotional affair? The editor had asked that I “share my story” about this subject, but the fact is, I don’t have one. I’ve never experienced this. The editor I worked with was surprised at this, because she thought sure that someone writing about it as I had must have gone through it. And I think that’s the key point here, when people are struggling with this they’ve had to gather their own research and figure things out on their own. I’ve heard from people even unsure about whether or not they should bring the subject up with their spouse. My response is that if it’s bothering you, of course you should! But it’s a subject that people feel funny talking about, and since I’m the queen of covering subjects people don’t like talking about I wanted to share my research about emotional affairs. Hence, the book! I’m excited about this book because I really do feel that it will help answer questions and help people figure out the next step. I’ve build my brand on not just writing about difficult subjects but sharing the solutions to them. While getting things out in the open is helpful, it’s only one step in the process. The true value in telling your story is in talking about what happens when you come out the other side, to reclaim the wholeness in your emotions, or in this case, in your marriage. Not all friendships are created equal. Sometimes a friendship crosses the line into an emotional affair. Inappropriate friendships hurt, and they can be every bit as damaging to a relationship as a sexual affair. Emotional affairs are very real and can be very harmful. • What exactly is an emotional affair? • How can I prevent one from happening in my relationship? 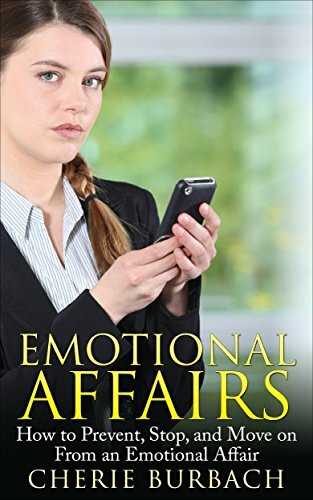 • What should I do if I am in an emotional affair right now? • How can my partner and I move on from an emotional affair? I like that it ends with tips on how to move on. Like most issues, I think the first step is discussing it. As soon as I announced this book on Facebook I immediately got several messages there and through this website. It reinforces to me how needed this book is, so if you know of someone who is going through this now, please share it with them. If you’re going through it yourself right now, take heart! It’s not easy but there are ways to get through it and come out stronger with your spouse. And if you read the book and enjoy it please take a moment to offer up a review on places like Amazon.com. It will help others who are looking for this information.